For other uses, see Beverly Hills Cop (disambiguation). Young and reckless Detroit Police Department's detective Axel Foley's latest unauthorized sting operation goes sour when two uniformed officers intervene, resulting in a high-speed chase through the city which causes widespread damage. His boss Inspector Douglas Todd reprimands Axel for his behavior and threatens to fire him unless he changes his ways on the force. Axel arrives at his apartment to find it has been broken into by his childhood friend, Mikey Tandino. Mikey did time in prison, but ended up working as a security guard in Beverly Hills, thanks to a mutual friend, Jenny Summers. Mikey shows Axel some German bearer bonds and Axel wonders how he got them, but chooses not to question him about it. After hanging out at a bar, they return to Axel's apartment, where two men knock Axel unconscious and then confront Mikey about the bearer bonds, and kill him. The Beverly Hills City Hall featured prominently in the Beverly Hills Cop films as the police headquarters. 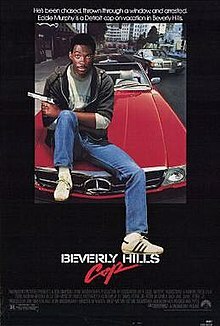 Beverly Hills Cop received critical acclaim upon its release, and is considered by many as one of the best films of 1984. [unreliable source?] Janet Maslin of The New York Times wrote "Beverly Hills Cop finds Eddie Murphy doing what he does best: playing the shrewdest, hippest, fastest-talking underdog in a rich man's world. Eddie Murphy knows exactly what he's doing, and he wins at every turn". Richard Schickel of Time magazine wrote that "Eddie Murphy exuded the kind of cheeky, cocky charm that has been missing from the screen since Cagney was a pup, snarling his way out of the ghetto". Axel Foley became Murphy's signature role and was ranked No. 78 on Empire magazine's list of The 100 Greatest Movie Characters of All Time. Also, Entertainment Weekly magazine ranked Beverly Hills Cop as the third best comedy film of the last 25 years. According to Christopher Hitchens, the British novelist and poet Kingsley Amis considered the film "a flawless masterpiece." Review aggregation website Rotten Tomatoes retrospectively collected reviews from 45 critics to give the film a score of 82%, with an average score of 7/10. The site's consensus reads, "The buddy cop movie continues its evolution unabated with this Eddie Murphy vehicle that's fast, furious, and funny." In 2003, the film was picked as one of the 1000 Best Movies Ever Made by The New York Times. The soundtrack was released on MCA Records and won the Grammy Award for Best Score Soundtrack for Visual Media (1986). The instrumental title tune, "Axel F", composed and performed by Harold Faltermeyer, is a cultural touchstone and has since been covered by numerous artists. The soundtrack was mastered by Greg Fulginiti at Artisan Sound Recorders. This film is No. 22 on Bravo's list of the 100 funniest films. ^ "BEVERLY HILLS COP (15)". British Board of Film Classification. December 10, 1984. Retrieved November 28, 2015. ^ "Beverly Hills Cop Production Budget". The-Numbers.com. Retrieved May 21, 2010. ^ a b "Beverly Hills Cop". Box Office Mojo. ^ a b c d e f g Cronin, Brian (January 16, 2013). "Movie Legends Revealed: Sly Stallone as Axel Foley?". Comic Book Resources. Retrieved June 12, 2014. ^ O'Connell, Sean. "Sylvester Stallone turns down Beverly Hills Cop Script according to book". Retrieved August 11, 2016. ^ "Re-Cast: Five Blockbusters Completely Changed For Their Star". Empire Magazine. Retrieved November 13, 2010. ^ Gruson, Linsey (December 16, 1984). "EXIT STALLONE, ENTER EDDIE MURPHY". The New York Times. Retrieved June 12, 2014. ^ Gruson, Linsey (December 16, 1984). "20 Fascinating Facts About The 'Beverly Hills Cop' Franchise". The New York Times. Retrieved June 12, 2014. ^ "The Best Movies of 1984 by Rank". Films101.com. Retrieved May 21, 2010. ^ "Beverly Hills Cop, Film Review". The New York Times. April 29, 2003. Archived from the original on October 3, 2012. Retrieved May 21, 2010. ^ "Cinema: Eddie Goes to Lotusland". Time. December 10, 1984. Retrieved April 26, 2010. ^ "The Amis Inheritance". New York Times. Retrieved September 27, 2012. ^ "Beverly Hills Cop Movie Reviews, Pictures". Rotten Tomatoes. Retrieved May 21, 2010. ^ "The Best 1,000 Movies Ever Made". The New York Times. April 29, 2003. Retrieved April 26, 2010. ^ "Longest Top Ranking Movies (Conesecutive Weeks". Box Office Mojo. ^ "1984 Yearly Box Office Results - Box Office Mojo". Retrieved December 30, 2016. ^ "Beverly Hills Cop (1984)". Box Office Mojo. Retrieved May 31, 2016. ^ "Bravo's 100 Funniest Movies of All Time". Boston.com. July 25, 2006. Retrieved May 21, 2010. ^ "Bravo's "100 Funniest Movies"". listsofbests.com. Archived from the original on July 3, 2010. Retrieved May 21, 2010. ^ Hibberd, James (February 22, 2013). "Hollywood Insider: What's Going on Behind the Scenes: TV's Pilot Season Goes (Very) High-Concept". Entertainment Weekly. New York: Time Inc. Retrieved January 15, 2017. ^ Child, Ben (July 22, 2013). "Beverly Hills Cop TV series shot down". The Guardian. Retrieved January 15, 2017. ^ Obenson, Tambay A. (July 22, 2013). "'Beverly Hills Cop' TV Series Officially Dead. BUT Pilot Tested Well, So 4th Movie In Development". Indiewire. Retrieved January 15, 2017.